��� Australian Rules football is of course a sport unique to Australia, and perhaps the most unique aspect of the game is the famous speccy mark. There is nothing that excites the crowd as much as a big grab, with a high-leaping player soaring in the air above the opposition to mark the ball. Over the years many famous players have achieved near immortality for the deeds they have performed while soaring skyward. Countless kids have tried to emulate their heroes by flying high in the backyard by whatever means they could, trying to be just like Alex Jesaulenko, Trevor Barker, Warwick Capper, Tony Modra, or the legendary Gary Ablett. 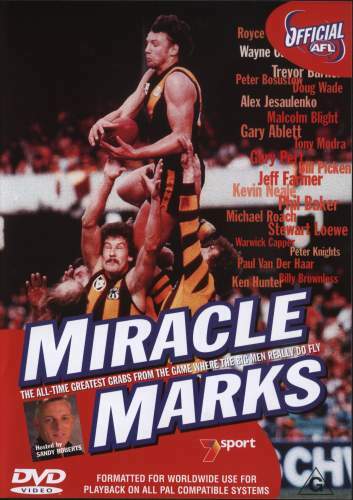 ��� Like its sister disc Golden Goals, Miracle Marks contains over 70 minutes of some of the best and most spectacular marks seen over the last forty-odd years in VFL/AFL football. The footage has been culled from the countless hours of television footage of Channel 7, the broadcaster of the game for more than 40 years. It is essentially just a highlights package, since even though there is an introduction of sorts by commentator Sandy Roberts to each section, he really provides just a brief thirty second intro. There is no analysis of the game, no interviews with the players, coaches, or media people, and no other behind-the-scenes footage. While the whole thing does tend to feel a little cheaply done and get a little repetitive, it is still a worthy compilation for the true Aussie Rules fan. It contains some of the best marks the game has ever seen and some iconic moments that we will all remember forever. ��� The program is broken into chapters which for some strange reason are shown chronologically in reverse starting from 1999. This program was made in 2000 when Channel 7 still retained the broadcast rights for the AFL and so chapter one is named Modern Marvels and features the players from around 1998 and 1999. We then get the marks from 1997 & 1996, The Mid 90s, 1992-1998, and a few 80s grabs in High Flying Memories. Adding to the package are some excerpts from the documentary series The Sensational 70s showing the best marks of that decade. About five minutes of black and white footage from the 1960s completes the program. ��� All the big grabs of the last forty years are included, including Carlton's Alex Jesaulenko and his famous 1970 grand final leap and the amazing last round effort from Melbourne's Shaun Smith right in front of goal in a game against the Brisbane Bears in 1994. We even get a glimpse of the infamous mark by umpire Peter Carey during the Fremantle versus St Kilda match at Subiaco Oval in 1999. ��� The newer material (from around 1996 onwards) is easier to watch as much of it is aided by the use of slow motion replays. A great number of the earlier marks are not replayed at all, so blink and you will miss them. ��� The video quality on offer here is virtually identical to the Golden Goals disc, with the main difference being the inclusion of a little more black and white footage from the late 1960s and early 1970s. It is presented in an aspect ratio of 1.33:1, and the transfer is not 16x9 enhanced. ��� Again the transfer is solely comprised of television broadcast quality footage, mostly in colour and ranging from the mid to late 1960s through to the late 1990s. ���While the footage is of mixed vintages, it is mostly of reasonable quality. The 70s and 80s highlights are certainly a bit fuzzier and not as sharp as the late 90s material, but the technological advances in broadcast camera equipment makes this perfectly understandable. The quality of the 1960s black and white footage is highly variable as one could well imagine. Dirt, grain and noise is evident throughout in various quantities but is to the level expected. Whatever process was used to film outside broadcasts back in those days leaves a slight fish-eye look to the footage which takes a little getting used to. The boundary fence and grandstand all seem to bend around as the camera pans quickly to keep up with the on-field action. ��� The colours are well enough rendered given the quality of the source material and there are no problems to contend with despite some of it certainly looking its age. ��� No MPEG artefacts are evident, and aside from plenty of obvious analogue tape problems in the older footage, a little dirt and noise, it is mostly clear of other imperfections. ��� There are no subtitles which is a shame, as I would have liked to see how they would display the famous commentator exclamation " Gary Aaaaaableeeeeeeeeett!!!" ��� This is a single layered disc only so there's no layer change to worry about. ��� The audio is identical to that found on the Golden Goals disc. Seeing as the disc is comprised almost exclusively of television highlights, we get television quality audio. That is not to say it is bad. It does its job and that's all that can be expected. ��� There is only one audio track available, that being an English Dolby Digital 2.0 soundtrack. ��� Dialogue is clear and concise at all times, if perhaps a little harsh when the commentators get carried away with excitement and the roar of the crowd tries to drown them out. ��� There is no surround or subwoofer use. ��� There are no real extras on this disc. ��� This disc is not available in Region 1. ��� Miracle Marks is another in the highlights packages focussing on the deeds of Australian Rules footballers over the last 40 years. As a highlights package it achieves what it is designed to do. But like Golden Goals it does get a little repetitive. Mark, after mark, after mark, some very similar and some not all that speccy. It is nice to have a collection so complete if even it does have a bit of a budget feel to the whole thing. ��� The video is average, but based on the source material is more than acceptable. ��� The audio is workmanlike without being outstanding. ��� There are no extras. Display Loewe Calida (84cm). Calibrated with Video Essentials. This display device is 16x9 capable.